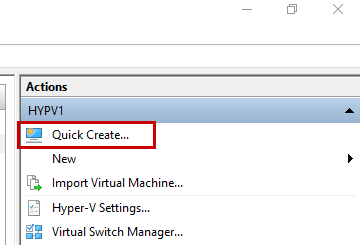 In Windows 10 Fall Creator Update, Microsoft introduced a new feature called the “Hyper-V Quick Create Wizard” which is very useful because you can create a Virtual Machine with the default settings and save time. Using this feature, you can create a VM with a single ISO file located on your system, or you can create a VM from the Online Gallery. 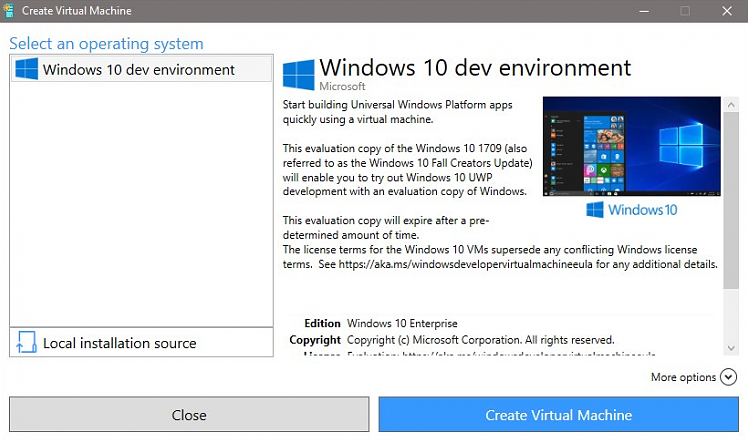 By default, Quick Create will list a Windows 10 Developer Environment but you can easily add your own Virtual Machine Images from your local/online repository. In this article, I will describe how to use this feature and how to add a custom VM Image into your own Gallery. Open the Hyper-V Management Console and click “Quick Create…” to open the wizard an confirm that the default Online Gallery is loaded. When you open the “Hyper-V Quick Create” window, it will open all pre-set virtual hard disks located in your local repository or Online Gallery. 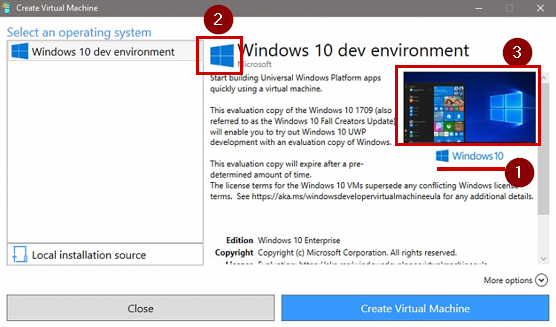 At this step, you can only use the Windows 10 dev environment or create a new VM from a local source. How to Add a Custom Virtual Machine Image in the Gallery? This hash will be used by the JSON code to display the image in the “Quick Create” window. 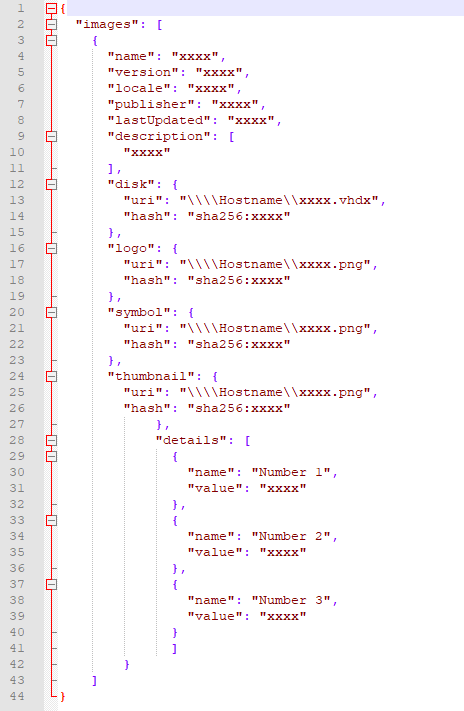 Please note the hash for each image because you will need to copy/paste it in the following JSON code. Do not forget to store the VHDx disk in this folder and sysprep the disk. Of course, the sysprep is not mandatory to add the image in the Custom Gallery. To finish, create an empty JSON file and copy/paste the following code. Note that if you edit it in VSCode, it will automatically provide IntelliSense. disk uri/hash: Here, it is important to note that you can use a website in the uri field or a network path. If you use a network path, do not forget to add two backslashes to escape the slash character. Note that you can also add a “requirements” section. Look for the GalleryLocations item. Note: To deploy this setting on multiple machines, you can use a Group Policy Object. Note: If the custom image does not appear in the list, then there is probably a wrong path or a wrong filename in the JSON file. 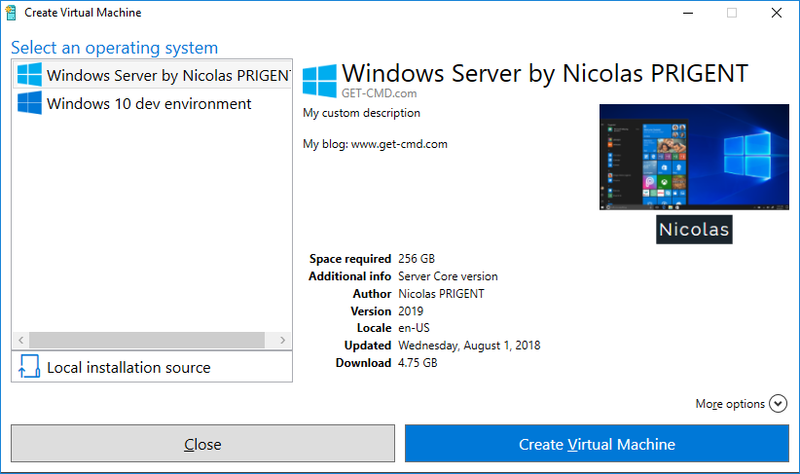 Thanks to this new feature, you can easily use your own Virtual Machine images in the “Hyper-V Quick Create” in order to create a new Virtual Machine. You can also share your Gallery with your colleagues. Nicolas Prigent works as a System Engineer, based in Switzerland with a primary focus on Microsoft technologies. Nicolas is Microsoft MVP in Cloud And Datacenter Management with 8 years experience in administering Windows Servers, Hyper-V and System Center products. He also received the "PowerShell Heroes 2016" Award.